These six galaxy clusters are a subset of the 38 that scientists observed with Chandra, with distances ranging from 1.4 to 9.3 billion light years from Earth, to help determine the Hubble constant. The Hubble constant, or the Hubble parameter, is a critically important number that sets the expansion rate of the Universe, and is derived by measuring the speeds that the clusters are moving away from us and dividing by the cluster distances. 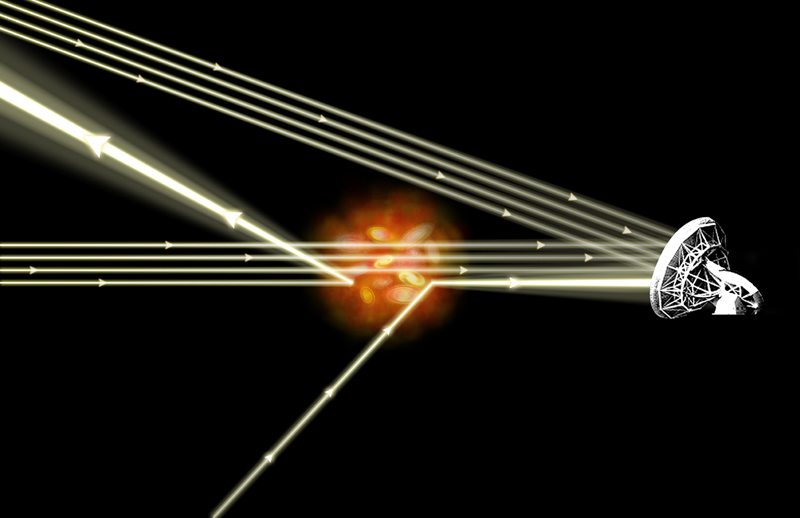 A combination of X-ray and radio observations allowed astronomers to determine the Hubble constant using the so-called Sunyaev-Zeldovich effect. In this phenomenon, photons in the cosmic microwave background (CMB) interact with electrons in the hot gas that pervades the enormous galaxy clusters. The photons acquire energy from this interaction, which distorts the signal from the microwave background in the direction of the clusters. The magnitude of this distortion depends on the density and temperature of the hot electrons and the physical size of the cluster. Astronomers used radio telescopes to measure distortions of the cosmic microwave background. 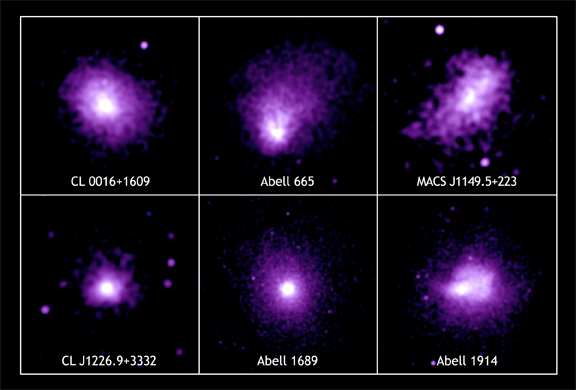 Chandra measured the properties of the hot gas revealed in X-ray emission, which told astronomers the physical size of the galaxy clusters and thus allowed their distances to be determined. The value for the Hubble constant derived from this method, which is independent of previous techniques, was found to be 76.9 in its traditional units of kilometers per second per megaparsec (a megaparsec is equal to 3.26 million light years.) Taking into account the small uncertainties, this result agrees with the values determined by other techniques, and fixes the age of the Universe between 12 and 14 billion years. Scale Image is 4.4 arcmin across. Coordinates (J2000) RA 00h 18m 33.50s | Dec +16° 26´ 12.50"
Scale Image is 5.6 arcmin across. Coordinates (J2000) RA 08h 30m 58.10s | Dec +65º 50' 51.60"
Coordinates (J2000) RA 11h 49m 35.50s | Dec +22° 24´ 02.30"
Coordinates (J2000) RA 12h 26m 57.90s | Dec +33° 32´ 47.40"
Scale Image is 8.1 arcmin across. Scale Image is 7.6 arcmin across. Coordinates (J2000) RA 14h 26m 00.80s | Dec +37° 49´ 35.70"